Elon Musk is not a man who minces his ambitions; last year he said that one of SpaceX’s goals was to facilitate the colonization of Mars. 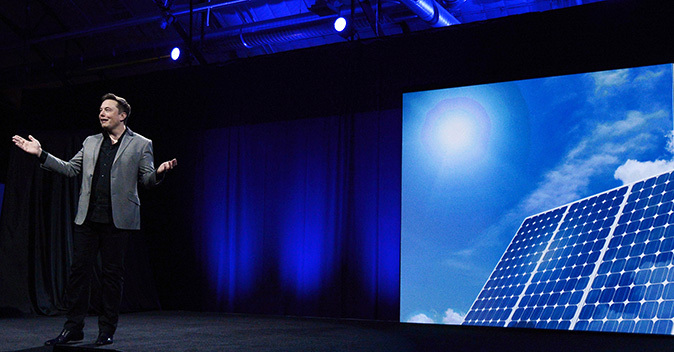 On Thursday night, Musk introduced Tesla Energy—a solar battery system for homes, businesses, and public utilities—with characteristic bluntness, casually rolling off the number of Power Pack units it would take to supply enough energy for the entire world. The selling point of the Power Wall and the Power Pack is that they offer a vast improvement over existing solar battery systems and can be produced cheaply enough to be as universal a device as the cell phone. The battery units have thermal control, DC to DC conversion functions, and can work with solar panels right out of the box. The 7 kWh Power Wall costs $3,000 and is small enough at 4 feet tall, 3 feet across, and 6 inches thick, to snugly fit on your garage wall. Musk wants one in every home, including ones that currently don’t have access to electricity. “It’s analogous to the way mobile leap-frogged landlines,” Musk said, referring to the pattern where the world’s poorest communities often have greater access to cell-phones than telephones. The 100 kWh business-class Power Pack is touted by Musk as “designed for infinite scalability.” With enough of them, you should be able to power a small city, Musk said, or more. Amazon and Target have already ordered shipments of the Power Pack. In his keynote speech, Musk stressed the eminent plausibility of his goals, pointing out that there’s the industrial capacity to produce at that scale, given that there are around 2 billion cars on the road, and that 100 million are made every year. Tesla is making enormous investments in the expectation of huge sales for the Tesla Energy system. The company has made a $5 billion dollar bet on a battery Gigafactory in Nevada, which, at 10 million square feet, is more than four times the size of the Dallas Cowboy stadium.